Gebel Mahroum – In the morning we will pick you up at the reception of your hotel in Sharm El Sheikh, Dahab, Taba or Nuweiba. 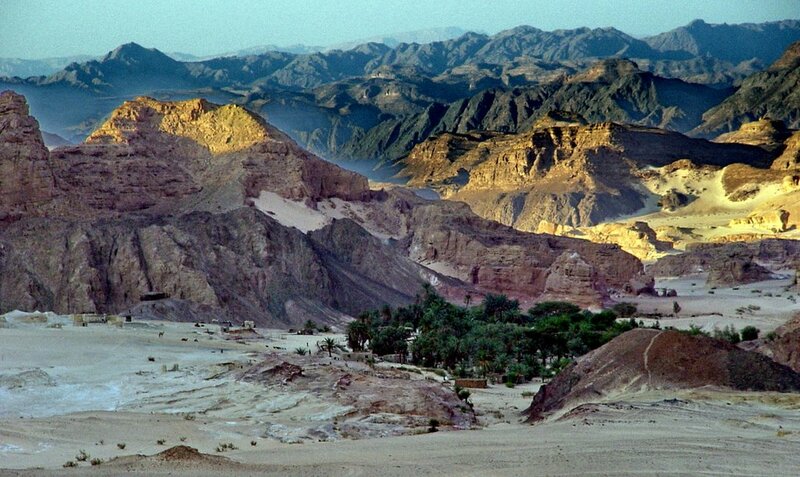 If you stay in any other part of Egypt such as Cairo we can of course organize the transfer to Sinai for you. We will take you in a 4×4 jeep through the fascinating mountain and desert scenery to the Colored Canyon where you will enjoy a hike through this stunning gorge; its rock formations are extraordinarily beautiful as you cannot only find diverse shapes, but also a multitude of different colors which gave this canyon its promising name. So don’t hurry, take your time to enjoy the unique surroundings and take a rest whenever you need. Some passages are a bit tricky, but your guide will of course assist you in case you need some help. 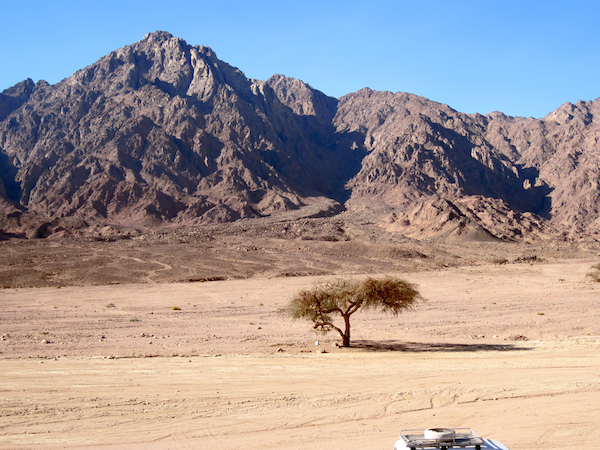 Then we will continue the jeep tour through the famous Wadi Ghazala, one of Sinai’s longest valleys, which is named after the gazelles that are told to graze here. It is a great and fascinating part of the desert, with sandstone rocks, caves, dunes, broom and acacia trees – a perfect place for a lunch break. In the late afternoon we will take you to the Ein Khudra Oasis, a beautiful oasis with a spring surrounded by numerous palm trees. If you like, you can have a bath here before you will have dinner and go to sleep. After breakfast you will hike through the beautiful White Canyon. The gorge received its name because of its splendid bright rock walls. Take your time to enjoy the unique landscape while you trek through the canyon, and keep your camera ready! Then you will be taken to the Gebel Barqa, the ‘Mountain with a Hole’, a popular bizarre sandstone formation belonging to the Gebel Mahroum, with a hole cutting through it. In this area you can also find numerous other rock formations as well as small caves and sand dunes. You will have time to stroll around a bit while your lunch will be prepared. In the afternoon you will continue your ride through the beautiful landscape with its stunning sandstone formations until you will reach the idyllic spring Bir Safra situated at an open area where two valleys cross. You can refresh with the spring’s clear water. Then you will hike to the great sand dune Al Heduda – it is really something special as the Sinai desert consists mostly of mountains and doesn’t offer a lot of space for large dunes. You will enjoy a great break; you will have lunch and you can wander on the dune – or rolling down. You will encamp today in the scenic Wadi Arada. 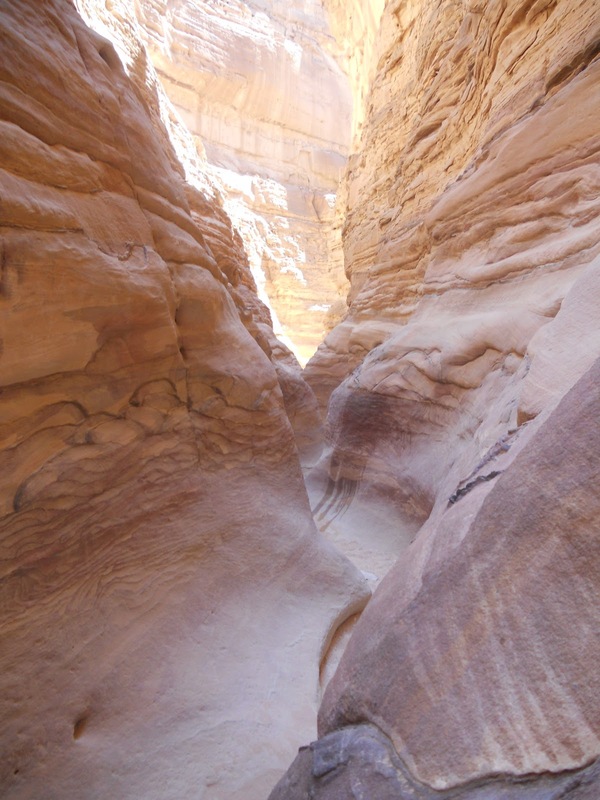 Today you will discover the Wadi Arada with the wonderful Arada Canyon, which is also known as the Double Canyon as two branches lead away from the same entrance. 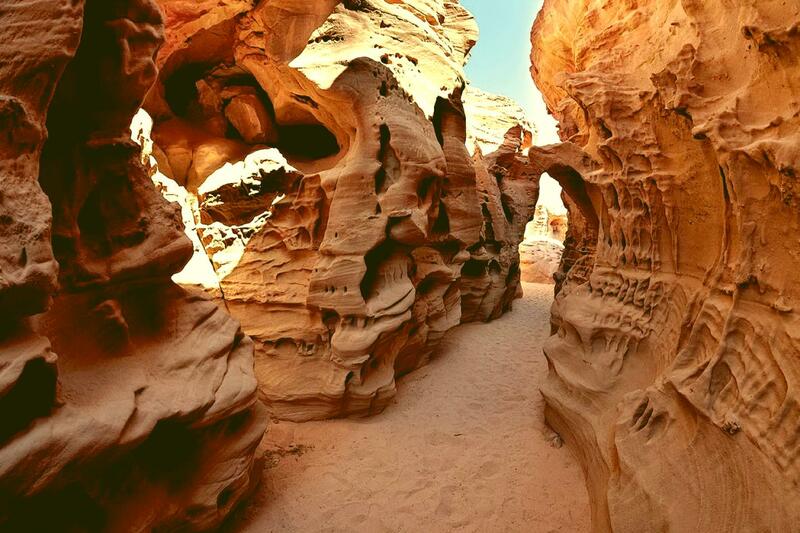 You will see bizarre rock formations in different colors and enjoy great views. Some climbing parts are a bit tricky, but your experienced guide will assist you, so if you are adequately fit there will not be any problem. Finally you will reach to a steep sand dune – if you like, you can scale it! Here you will also have lunch. Also this area is full of interesting ancient rock paintings; you can visit some of them. In the afternoon we will transfer you back to your hotel. This concludes our program and services.